Pattaya United FC have announced the appointment of Chalermwut Sangapol to be their new head coach for the remainder of the 2011 Thai Premier League season. ‘Coach Nui’ as he is affectionately known was introduced to the media at a press conference held at the Nongprue district sport field on Wednesday, June 22. Sangapol was previously coach of the Thailand national U19 football team. Chalermwut Sangapol a.k.a. 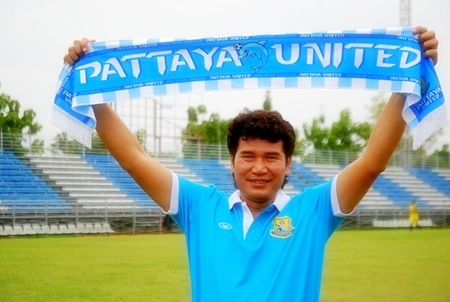 ‘Coach Nui’ holds a club scarf as he is introduced to the Pattaya United fans and media at a press conference held June 22 at the Nongprue district sport field. Following a disappointing opening half of the season, United’s former coach Jatuporn Pramolban felt compelled to tender his resignation which left the club frantically searching around for a suitable replacement during the mid-season break. United have dropped to 14th position in the Premier League standings following a run of poor results but ‘Coach Nui’ is confident he can turn the club’s fortunes around and help propel the team up the league table, although he cautioned there would be no quick fixes and only a tremendous work ethic from everyone involved in the club would suffice. During the press conference, which was chaired my Pattaya city mayor and club chief advisor, Ittiphol Khunplome, it was revealed that United youth players Pirapat Pongsen, Wasan Charam, and Adisak Harnthet were recently selected for the national U19 team which was vindication of the youth policies being introduced at the club. United are opening up their academy this month to screen for further outstanding young prospects aged between 16 and 18 years who they can retain for further coaching with an eye on grooming them for the first team. 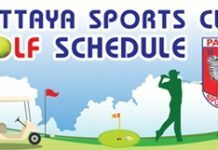 The final selection round is scheduled to take place on July 9 and 10 at the Nongprue football field. In the meantime the first team squad will return to league action under the watchful eye of their new coach on Saturday July 2, with an away fixture at high flying Bangkok Glass FC.